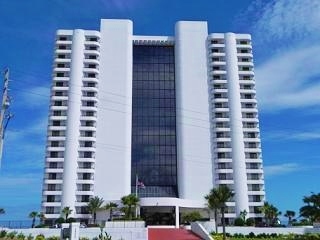 The Peck built Sherwin Condominium located on a drive beach in the Daytona Beach Shores, features a 20-story Grand Atrium complete with a beautiful waterfall and golden dolphin fountain. This condo has a fabulous penthouse clubroom for your special events, birthdays, holidays or reunions! 2 and 3 bedroom units available with ocean and river views! This 20 story, 127 unit complex allows 2 pets up to 20 lbs, a 2 week rental policy and located near food stores, banks, Walgreens, attractions and many excellent restaurants.